Four years in the making, Africa launched in January in the UK with the first episode attracting 6.5m viewers. 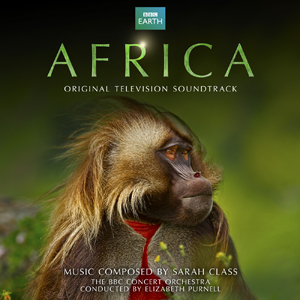 As with Life On Earth and Frozen Planet, music is integral to the production and Emmy-nominated composer and singer-songwriter Sarah Class delivers a subtle and serene yet emotional score that perfectly fits the narrative. A prodigy of Sir George Martin and a 2001 Classical Brit nominated artist for Aurora-Cantamus, Sarah Class has since built a reputation as a composer of choice for big budget natural history films. Her most notable successes include the environmental sequel to The Blue Planet - Deep Trouble, The Greatest Show On Earth (A Millennium special) and the soundtrack for the flagship David Attenborough series, The State of the Planet in 2000. Sarah is also well known for her writing for Hayley Westenra's worldwide smash album Pure. Currently Sarah is one of the UK's most sought after composers and her style was described by HMV Classical Reviews magazine as both "hauntingly ethereal and sensual, mingling folky influences and a powerfully romantic blend of orchestral and electronic sonorities". La-La Land Records and a Shout Out! !